The World Meeting of Families opens on Wednesday 22nd August in the RDS. The theme for the Pastoral congress on that day is ‘Family & Faith’. Mass will be celebrated in the Main Arena at 4.30pm. 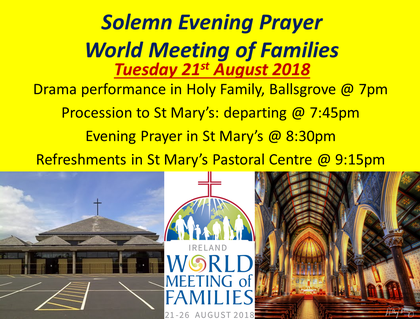 The Meath Diocese will participate and members of the Mornington Gospel Choir are involved in the choir. will leave Mornington Church at 8am on Sunday 26th August. The tickets for Croke Park & The Phoenix Park are being distributed this week.